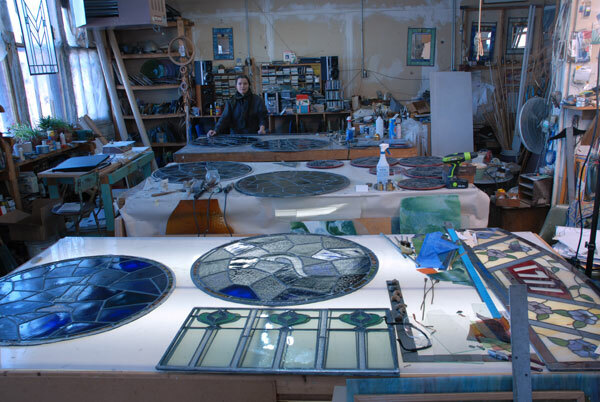 Seven round historic stained glass windows were completely restored by Opal Glass Studios. 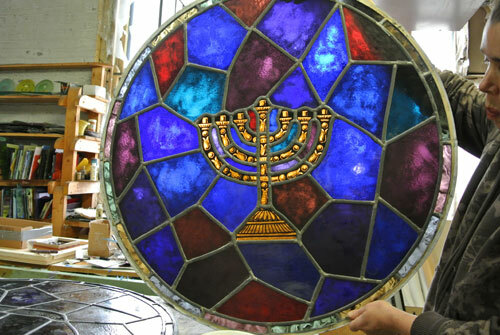 The windows were donated to the Emanuel Congregation by the Tawani Foundation. Sharon worked with a team of people to see the successful completion of this project. Blender Architects designed the opening for the windows. Mike Wilson of Trimac Restoration created the new opening to display the windows breaking through a masonry wall to do so. Randall Kramer of Kramer Design fabricated heavy steel frames and rods to support the windows. The final team effort was a stunning repurposing of historic windows. The final team effort was a stunning repurposing of historic windows and the project was written up in Chicago Architect (click on link).